Are you ready to up your running game? Training at the same pace and mileage can actually slow your progress. You need to change things up to have a stronger, faster and more productive workout. 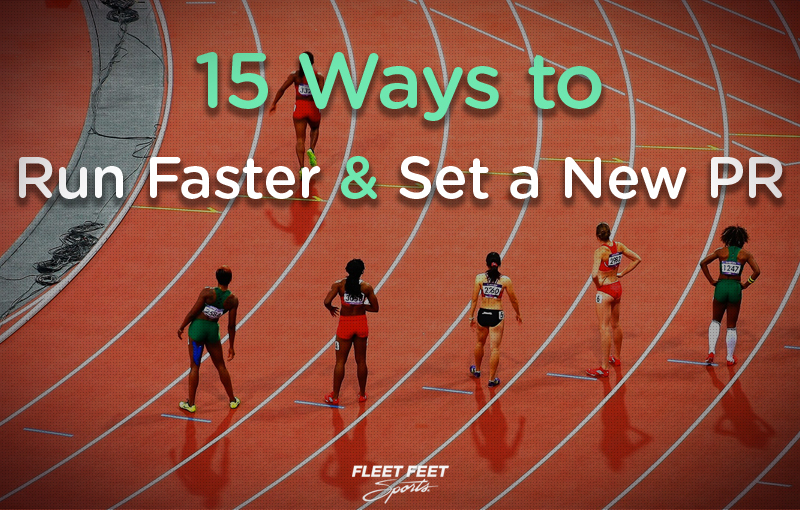 Whether you are looking to set a PR or just get faster, we can help. It may be challenging at first, but your hard work will pay off! Do you have proper running technique? Keep your torso tall yet relaxed, strike the ground with the mid-foot landing under the hip, and swing the arms forward and back at a low 90 degree angle – rather than across your body. If you have any questions about form, stop in - our staff is happy to help! During your run, alternate between hard burst of effort (think 8-9 out of 10 effort level) and an easy recovery pace. Not only does this build speed and endurance, interval training can help you shed a few pounds. This is a fancy way of saying, learn how many steps you take in a minute. Elite athletes take about 180 steps per minute and take short, light steps. To calculate your stride, count how many times your right foot hits the ground in a minute and multiply that by two. It’s hard to run fast if you’re tight and sore. Regular stretching keeps you flexible. A foam roller or The Stick allow you to practice self massage and ease tight spots. We carry a variety of foam rollers and sticks for you to choose from - just ask us which is best for your needs. Grab a jump rope and go for it! Jumping rope helps feet get faster. Hit up the elliptical machine which mimics the movements of running without the impact. Elliptical workouts develop faster leg turnover without stressing your joints. Sugar can slow you down. It’s okay to indulge once in awhile, but limit your treats. The bulk of your foods should be whole grains, lean proteins, fruits and vegetables for sustained energy and quick recovery. Not sure what to eat before a run? Check out our blog post The Best Snacks to Eat Before Running. Studies show that runners who trained in multiple pairs of running shoes had 39% less injuries than those who ran in a single pair. The theory is different shoes have a different impact on your gait. Want to try out a new pair? Come see us and get fit. A strong core can improve your posture and stamina. For best results do 15 minutes of core work 2 - 3x a week. Breathing through both your nose and mouth gets you the most oxygen. Practice breathing into your stomach rather than chest for better endurance. Yoga can help with this. Hills are speed work in disguise. Hill repeats build strength, endurance and get you faster. Stronger muscles are key to firing you up and preventing injury. Two strength sessions a week with moves geared for runners can help take you to the next level. Looking down towards the ground can slow you down. Keep your eyes focused a few feet ahead of you and it will improve your form, your breathing and keep your eyes on the finish line. Caffeine can help boost performance during a run. Tea or a caffeinated gel will also work! Everything is easier after a good night’s sleep. Runner reactions times are sharper and speed work is faster. The less gear you have on race day the quicker you’ll be. Elite runners wear minimal clothing and light shoes for optimal performance. If you’re racing long, and looking for a light weight place to store your gels or water, try one of our fuel belts or handheld water carriers. We have plenty of options to choose from - just ask us for help finding the best one for your needs. Incorporating some of these techniques will help cut your running times. We invite you to join in our Wednesday night fun runs to provide extra motivation for getting out and running.